I went to hear a friend of mine preach last Sunday and had a marvelous time. Isn’t that funny, that we can actually have fun at church? In his sermon and his delivery I could see the seminary student. At other times I recognized the research he did in preparation. It was also clear that he allowed the Holy Spirit to lead him in the preparation and the delivery of his message. As I sat there soaking in all of the elements of the message, I found myself wondering. What makes a man like this even want to be a Christian? His message was full of reliance on God, reliance on the Spirit of God. His message was about the idols which we all set up in our hearts. One of the most prominent for preachers is that we tend to put our education and our ability to research and learn on the throne of our hearts. We get so busy trying to learn and convey what we have learned that we forget to actually yield ourselves and all that we are to the Lord. Craziness, right? As I listened, though, I became convinced that this is a man who truly adores God and who is submitted to him. For all the education and intelligence, this was a man hungry for more of God and humble before the Almighty. It bathed my heart is the sweet honey of the love of God. The anointing in me was stirred up by the anointing on the message. That is the sweet spot and there is nothing better. That anointing only comes from those who truly love the Lord and stand in awe of Him. We sometimes have to remind ourselves to look at the Father and appreciate the grandeur of who He is. Messages from the Holy Spirit are only given to those who yield their will to that of the Father. There is a loud note of trust here. I have to put what I know, or think I know, on the back burner and let the Holy Spirit be the teacher. First, the Spirit preaches the message to the preacher and then preacher gives it to the congregation. In order to receive that message, we have to stand in such reverential awe of Him that we are convinced that He will not let us down. We trust and know that He will deliver. Every aspect of life is this way. It is not only for preachers. Whatever work we do, in our relationships, with our money and everything else, we lay all those things on the floor of the throne room of God as we lift our eyes to gaze upon His beauty. From that adoration, praise and trust, from that intense sense of reverence and awe, flow all the miracles and all the sustenance. Understand this, to my friend, Jay, sustenance was a message for Sunday. It was one of his greatest needs. He had to trust God for it. There is great pressure in trying to develop a Sunday sermon. If you miss God in that situation, you do so before a crowd of people. Everyone knows you either didn’t seek God or you didn’t listen. That can put some pressure on you – if you let it. Just like everything in life, we must take all these worry generating circumstances to the Lord and trust Him to meet our need. Clearly Jay did just that. His message was anointed in the grace of the Father and the oil of the Holy Spirit. God delivered. God was trustworthy. Yahoo! That is shouting ground folks. If God will do it for a preacher in North Carolina, He will do it for you. God is no respecter of persons. His grace and mercy are for every single person on the planet. Jay appealed to the Holy Spirit and trusted God for the answer. That should encourage all of us. Whatever your problems, whatever your worries, lay them down. Look upon the Lord. See His magnanimity. I tell you truthfully, when we see God for who He is, not only does it arouse praise and reverence within us, it also minimizes the worries. We begin to understand that He is not only capable, but also willing. Look at the Father, our God. See the glory of His countenance. Let Him lift your heart. When you see Him, really see Him, you will lose all worry. You will know all your needs are met. Glory to God! So the answer why people, capable people even, submit to God and serve Him is because God is so great. Great is a much overused word but I just cannot seem to find a word big enough to describe the kind-hearted generosity and love the Father has for all who seek Him. This is also the answer to how we can actually have fun at church. When we experience God, there is nothing greater. It may be hard to describe to a non-believer or a cultural Christian but the heart soars in the presence of God. We experience true freedom and joy. Look upon the Lord. See Him for His greatness and the kind intentions of His heart. Stand in awe that the God of the Universe is your very own Father – if you let Him be. Out of the north comes golden splendor; Around God is awesome majesty. 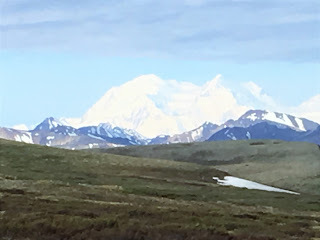 I have just returned from fifteen days in the great northern expanse of Alaska. For the life of me I just don’t understand how anyone can experience the majesty of Father’s creation and not acknowledge the creator. I don’t know how they don’t feel Him tugging at their heart strings or singing in their spirits. The majesty and awesomeness of our beloved Father is beyond words and I have found that it is beyond photography. I would send you a hundred photographs and still fall far short of capturing the grace and power of our Father’s creation. I was overwhelmed with one simple thought, “My Dad created all of this!” Wow! And the quiet whisper I hear in my soul is, “Yes, and I knew when I created it that you would be here today enjoying this rare beauty.” How precious we are in the sight of the Lord. The mountains and the sea, the glaciers and the wildlife cannot hold His attention. He is more gratified and engrossed by the wonder reflected in our eyes. Truly awesome majesty follows in the wake of our Father and God but the greatest wonder of all is that He loves us so much. In His eyes, there is nothing on this earth which compares with us. Is that not amazing? David said it this way, “What is man that You take thought of him?” (Psalm 8: 4). In the shadow of the of the imposing mountains such as this one, Denali, which means, The Great One, who is man that God even notices us? And yet, not a hair falls from our head that He does not notice (Matthew 10: 30). Surrounded by the majesty of Denali, the splendor of the fjords, and the power of the glaciers one feels instantly like an ant amongst the landscape … and yet, the grasp of insignificance never quite takes hold for in that moment our oneness with the Holy One, God the Almighty and Creator of all we behold becomes bigger in our hearts than the Great One herself, Denali. Greater by far is our God and Father and greater still is His devotion to us, deeper than the fjords is His love. The greatest wonder, the majesty of the age is God’s love for us.